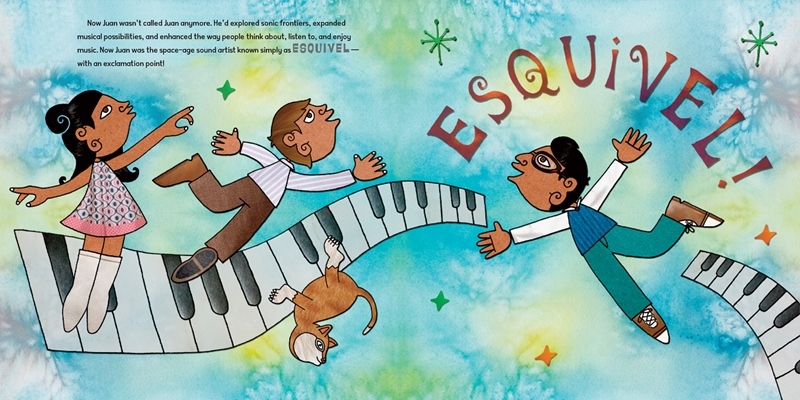 Like everybody else on the planet, the millions and millions, I was captivated by Susan Wood’s brilliant picture-book biography of the composer, Esquivel! 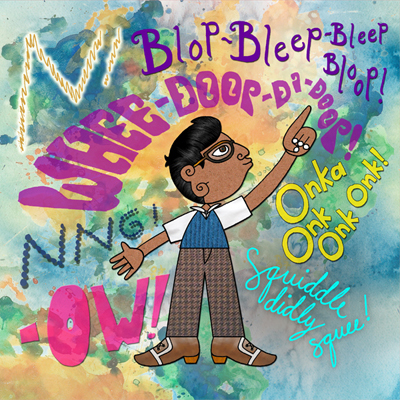 It’s bubbly and effervescent — whee-doop-di-doop! — well-researched and beautifully illustrated. A buoyant introduction to a singular artist. I was glad when Susan agreed to this interview. So one day you wake up and think: Esquivel! I want to write a book about him! Is that how it works? Well, um, not quite! Over a few decades, I’ve written a lot about music, both as a journalist and an author of books for adults and children. 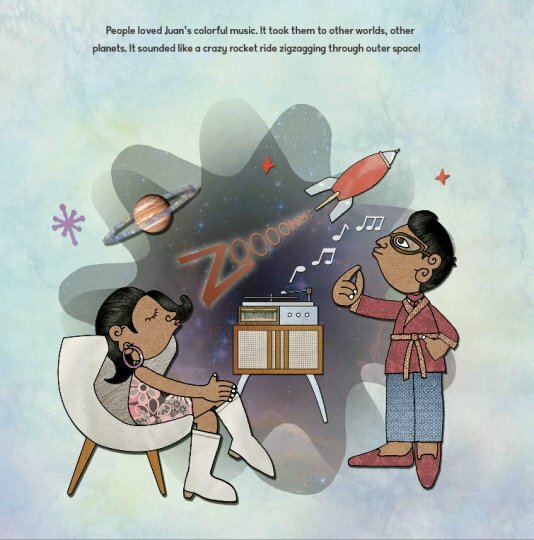 My earlier music-related books for young readers were a blast to put together and pretty well received—the middle-grade Raggin’ Jazzin’ Rockin’: A History of American Musical Instrument Makers (Boyds Mills) was an ALA Notable, and Rock ‘n’ Roll Soldier (HarperTeen), a YA memoir I cowrote with Vietnam vet Dean Ellis Kohler, with a foreword by Graham Nash, was a CCBC Choice. So I was definitely itching to write another music book for the youth market. I’d also done a deep dive into the picture book format with Under the Freedom Tree (Charlesbridge), illustrated by the wonderful London Ladd. For that book, London and I visited locations together and shared ideas, and I got to see firsthand how an illustrator works. [Ed note: for a “5 Questions interview with London Ladd, click here.] Through that rich collaborative process I became (and remain) obsessed with the visual aspect of penning a great story. I thought about music makers whose work has kind of a “visual” feel to it, a sound that could be depicted in illustration. Esquivel, with all of his zany instrumentation and textural arrangements, came quickly to mind. The music is so fun, so evocative — I thought kids would dig it, even if they hadn’t a clue who the guy was. 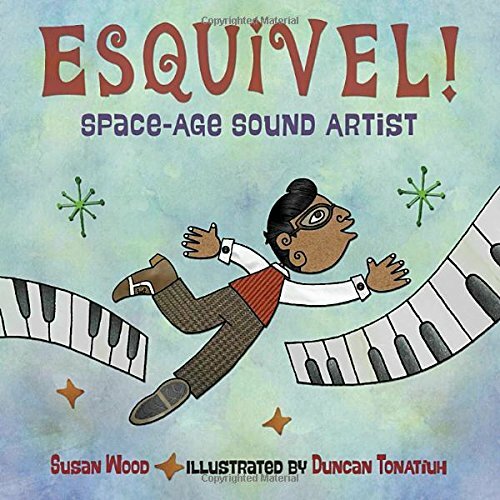 Honestly, I didn’t know much about Esquivel beyond the music; luckily, he led an intriguing life that could be shaped into a kid-friendly story arc. It feels like we’re living in the golden age of picture book biographies. We are seeing deeper, wider, more diverse “mini” biographies coming out each year. Would you agree with that? Absolutely. And I couldn’t be more thrilled, because biography/memoir is totally my thing. I’m always curious about what makes people tick, why people do what they do, how they navigate their lives — I’ve written/co-written bios/memoirs of rock ‘n’ roll trailblazers Gene “Be-Bop-A-Lula” Vincent (Race with the Devil, St. Martin’s) and Eddie “Summertime Blues” Cochran (Three Steps to Heaven, with Bobby Cochran, Hal Leonard) and rock photographer Tom Wright (Rock & Roll Turned Inside Out, foreword by Pete Townshend, Hal Leonard), and my picture book bio of artist Grant Wood (American Gothic, illustrated by Ross MacDonald, Abrams) comes out this fall. 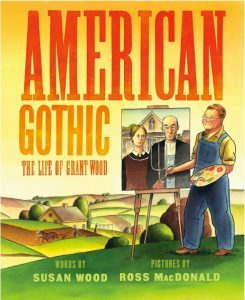 My PB biography of another painter is currently making the editorial rounds, and I’ve got a long list of other interesting folks whose stories I’d love to tell in the picture book format. I find writing picture book biographies far more challenging than penning bios for the adult market. You’ve got to distill a pretty full sweep of a person’s life into just a few pages. So every word’s gotta count! I imagine you begin by reading everything. It must be easy to become overwhelmed by the material. This guy had an entire life and you have less than 32 pages. Yes, I read as much as I can find and track down as many primary sources as possible—print and broadcast interviews, letters, documents, photos, articles, and such. At some point in my research, I’ll notice patterns, or themes, or how events build upon each other, and then I know it’s time to start writing. I can tease out those things, piece them together, move them around and shape and polish, and if I’m lucky, a compelling story will emerge. All the while, I’m keeping the visual component in mind—are there enough illustration opportunities in this tale? Do you ever feel like you can’t do it? Oh yeah. That’s when I close the file and go work on something else. Let it percolate on the back burner while I go about other business. Inevitably, as I’m walking the dog or doing dishes or driving my daughter to the ballet studio or my son to a robotics competition, I’ll usually have some kind of epiphany about how to move forward. Sometimes it takes days; sometimes it takes months. With Under the Freedom Tree, it took a few years to figure out how to tell the story of the first contraband slaves of the Civil War — as a picture book in free verse! Because: obviously! Let’s see, I think we’re about the same age. Like you, I became aware of Esquivel’s music in the ‘90s when the lounge music thing was blowing up. Back in the ‘90s I was working as an arts and entertainment correspondent for the big daily newspaper in southeastern Virginia, and record companies would send me their new releases for review. I remember receiving an Esquivel reissue, popping the CD in, and being completely blown away. What was this?! Way too clever, whimsical, and well crafted to be cheesy Muzak, yet super easy to listen and zone out to. Really genius. The acid test for any book about music is whether it sends a reader back to the records. And you achieved that. 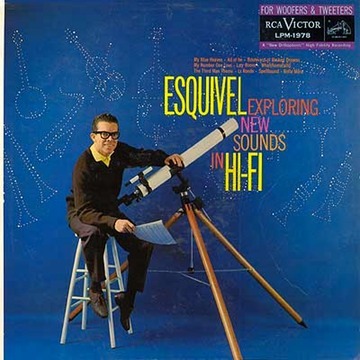 I’ve been listening to Esquivel all week. I’m so glad! It’s such brilliant stuff, isn’t it? And now thanks to YouTube and other sites, anyone can listen. And watch! Have you seen those amazing old Ernie Kovacs videos, kitchen appliances and office furniture dancing to Esquivel? So fun. Music has always been important to you. Music’s a huge part of my life. When I was a kid, my mom was a piano teacher, organist, and choir director, and my dad sang in her choirs. Of course, I did the requisite piano lessons, but also played clarinet and bassoon in school band and orchestra. Two of my brothers play drums, and my other brother is a professional guitarist. So lots of music going on at our house growing up! Though I graduated from NYU film school, it was an internship at Island Records—helping to create press releases for their smaller boutique labels—that really got me interested in writing about music, not just listening to or playing it. My first “real” job was at a NYC PR firm that handled music clients exclusively; when I left super-expensive NYC to return home to Virginia, I became a music journalist, writing for newspapers and magazines. Eventually I turned an article I wrote about ‘50s singer Gene Vincent into a book proposal, St. Martin’s Press bought it, and my first book was published in 2000. When I was in college and beyond, I enjoyed a long correspondence with an American poet named Kenneth Irby. He sent me great letters and was always encouraging about my lousy poems. What he said, over and over again, was “follow your enthusiasms.” And I’ve always held that as a central tenet to my writing. Trust in those things that quicken your heart. It seems to me that you are doing the same thing. That’s great advice. Reminds me of the words of wisdom a respected kidlit editor gave a writer friend of mine when she was struggling with what project to tackle next. “What do you love? What do you want to be known for writing?” the editor asked her, and I think about that every time I’m contemplating the next book. For me, it’s almost always music and art—visual arts, performing arts—usually in bio form. I want to be that “musicians and artists” chick. You’ve said that Esquivel’s music creates pictures in your head. But in the book-making process, your job as the writer was to use words to create pictures in the head of the reader, and, significantly, in the illustrator’s head, too. You wrote, for example, “It sounded like a crazy rocket ride zigzagging through outer space!” I loved how you attempted to match in language the music that you heard. Ha, that’s hysterical. 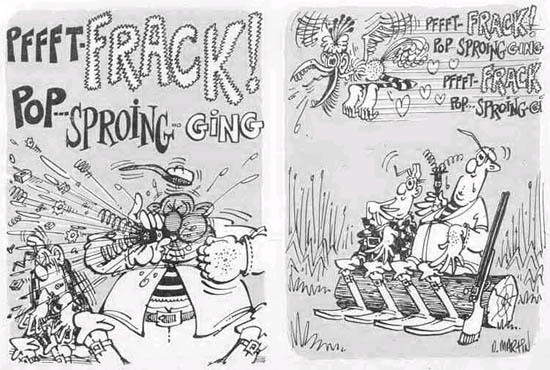 When it comes to inventing words to match sound effects, I always think of Don Martin from Mad magazine as the absolute master. Pffft-Frack! He’s a favorite of mine. Did you know the work of illustrator Duncan Tonatiuh before this book? No, I wasn’t familiar with Duncan. When Yolanda let me know who they had in mind to illustrate, I went right to Duncan’s website and was delighted. He was the perfect choice for this project! 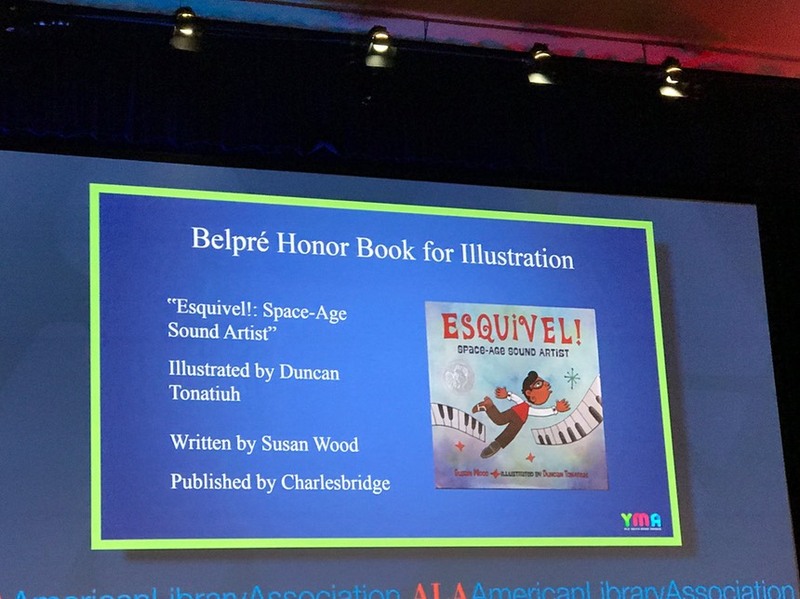 I’m thrilled that with Esquivel! he’s racked up yet another Pura Belpré Honor award. The books he’s written and illustrated are all so beautiful. Plus, he’s a genuinely nice guy. Describe your feelings on the day you first saw the illustrations. Seeing the finished art is one of the very best parts of the picture book process. You know the story, you’ve seen the sketches, but nothing compares with the final artwork in all its gorgeous glory. It’s always exciting to see an artist’s interpretation of your words; often it’s far beyond what you’d even imagined! I especially love how Duncan got the groovy late ‘50s/early ‘60s fashions and aesthetic in there while still being true to his style based on ancient Mexican art. Just to clear something up for me: You used to write under the name Susan VanHecke. Is that over? Are you working your way through the alphabet: V-W-X? What’s next, Susan? Do you have plans for a new book? Let’s see. 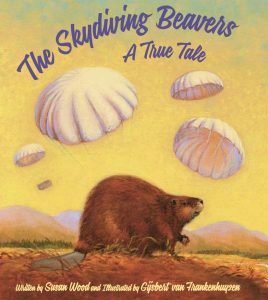 My picture book about a daring wildlife relocation by parachute, The Skydiving Beavers: A True Tale (Sleeping Bear), publishes April 15, and American Gothic in September. I need to confirm with the publisher, but I think my Little Red Hen retelling with a Mexican twist comes out in 2018, as does another picture book biography (nonmusic) that I can’t really talk about yet. Any candidates for another music biography? I’m working on a proposal with Albert Glinsky to adapt his definitive biography for adults of Russian musician, inventor, and spy Leon Theremin — yeah, that theremin — into a YA. And I have a few other ideas for music biographies, both YA and PB. So many musicians I’d love to write about! I’m also a professional copyeditor specializing in music texts, so when I’m not sweating over my own stuff, I live vicariously editing other authors’ music-related work. Thanks for stopping by, Susan. Hopefully we get to hang out someday. 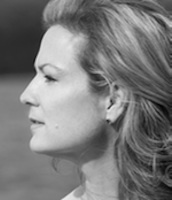 SUSAN WOOD keeps a swanky website that you can easily find, so I’m not going to provide a link. Do it yourself, people. Leave me alone. I’m not your slave. And get off the damn lawn, I just seeded. Authors and illustrators previously interviewed here: Hudson Talbott, Hazel Mitchell, Susan Hood, Matthew McElligott, Jessica Olien, Nancy Castaldo, Aaron Becker, Matthew Cordell, Jeff Newman, Matt Phelan, Lizzy Rockwell, Jeff Mack, London Ladd, John Coy, Bruce Coville, Matt Faulkner, Susan Verde, Elizabeth Zunan and Robin Pulver. To find past interviews, click on the “5 Questions” link on the right sidebar, under CATEGORIES. Or use the “Search” function.